I've finished the first column on the Double Wedding ring quilt and have made a bundle more arcs but I needed a little break. And a change of scene. The perfect time really to make my November blocks for Bee (a little bit) Japanese. Rick sent a bundle of green and red fabrics and asked for wonky log cabin in any style we liked. Slicing with gay abandon was so refreshing after the slow precision of the last couple of weeks. 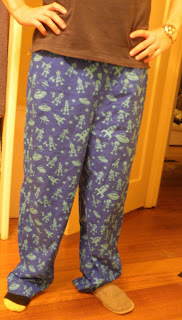 And tonight I whipped up a new pair of PJ pants for the Mr. He is an aerospace engineer so he likes space themed things. The fabric is Bot Camp from Michael Miller fabrics. He is happy with them, (so am I too, surprisingly. I thought the fabric would be too kid-ish but they look great). I loves it that I have finally made something for him, not 'people on another continent'. Perhaps sewing love needs to visit home more often. "People on another continent..." LOL! You did a great job with your blocks and the PJ pants!